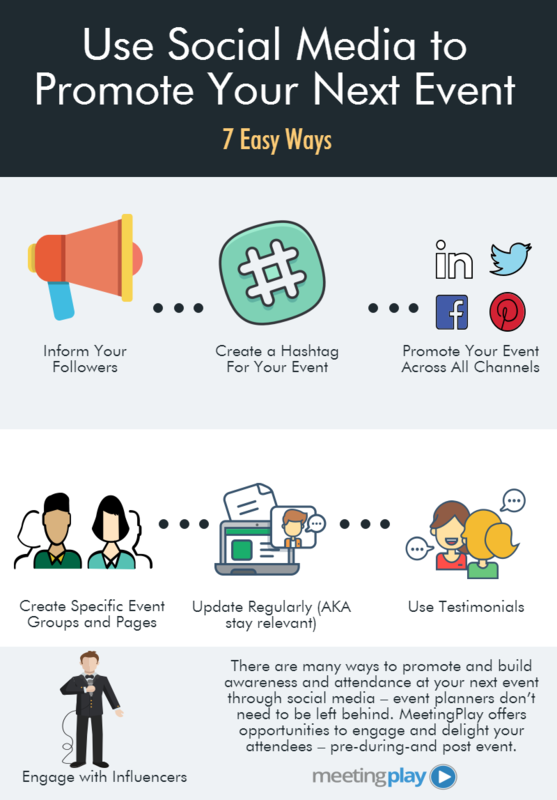 Here's 7 ways to use social media to promote your next event - just for you, #eventprofs! Many event planners already have a social following – do you have a following already? Leverage them. Share your event's details on your existing Facebook page. It’s not hard to generate an easy, quick, few character hashtag. Have a brand name or event name? Your mobile event app can turn into an event hashtag by just utilizing EVENTyear – i.e. for MeetingPlay, we would utilize #MeetingPlay2017. If we have more than one event this year, we would make it #EVENTNAME2017 or #EventName17. There are plenty of options - create a hashtag early and promote it from day one. Don’t just stop at Facebook. As an event planner, you may have an audience already on Twitter, LinkedIn, Instagram, or even a blog. Leverage and build awareness where your audience already is. LinkedIn and Facebook both allow the opportunity to have specific pages directed to events. As an event planner, you should certainly promote your event on your social media channels – but you should build specific event groups on LinkedIn and Facebook that allow you to better promote, encourage, and build awareness about your event. By regularly updating your social media pages (and groups), you offer the opportunity for your attendees to continue a connection to your brand and event. Odds are, if you had an event previously, you have great content already – your past attendees' experiences and testimonials. Share these across your social media channels to build not only brand and event awareness, but brand and event trust. Whether you’re planning the next big conference in the hotel industry, or you’re planning a seminar to engage current employees for your company, there is opportunity to reach out and network with other event planners in the mobile event app industry. Don’t stop at just engaging your attendees or potential attendees, instead, utilize an opportunity to network with other like-minded industry folks so you can promote your event across a broader network. There are many ways to promote and build awareness and attendance at your next event through social media – event planners don’t need to be left behind. MeetingPlay offers opportunities to engage and delight your attendees at all stages. What’s best – we allow you to track, measure, and see the results of these opportunities through our industry-best analytics reporting. Stop guessing – and start rocking your events with our mobile event app. Want to learn more? Visit our complete guide to event engagement to see how you can make your next conference or event stand out.